This cheesy and delicious tuna and rice bake is the answer to mealtime blahs, and the whole family will be happy. Cook the rice the day before to make preparation even faster. We made this again recently and added some diced pimiento for extra color and flavor. Heat the oven to 400 F (200 C/Gas 6). Butter a 2-quart baking dish. In a large skillet over medium-low heat, cook onion and celery in 4 tablespoons of butter until tender, about 5 minutes. Stir in flour, pepper, and dry mustard. Continue cooking, stirring, until smooth and just bubbly. Add Worcestershire sauce and gradually stir in milk. Cook, stirring, until thickened. Add about half of the cheese to the sauce mixture; stir until melted. Add flaked tuna and peas. If desired, stir in the pimientos. Taste and add salt, as needed. Spoon half of the hot rice into the prepared baking dish and spread about half of the remaining cheese over the rice; top with half of the hot tuna mixture, then repeat layers. Melt remaining 2 tablespoons of butter and toss with the bread crumbs. Sprinkle crumbs over the top. 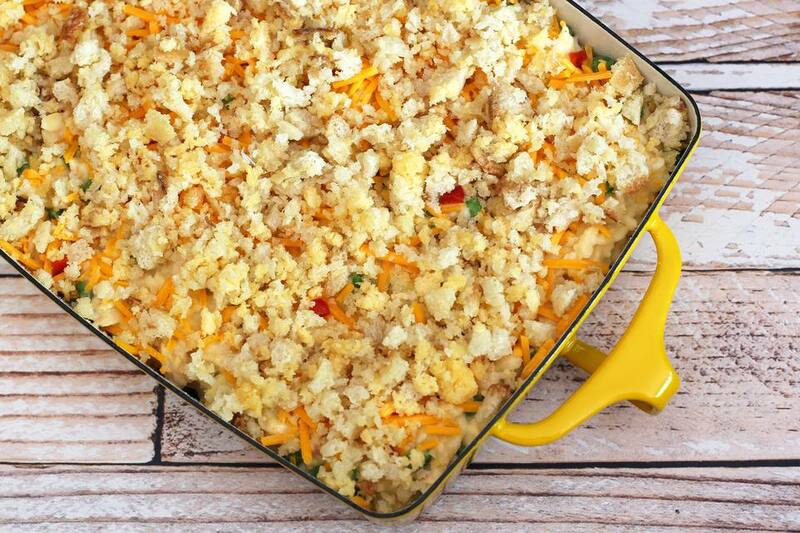 Bake in the preheated oven for 20 minutes or until the bread crumb topping is lightly browned and the casserole is bubbly around the edges.